Once you start thinking about selling your jewelry, jewelry business books become your new best friend. They can save you so much time, effort, and save you a ton of money. About ten years ago there was nothing in the way of business resources specifically for the home-based jewelry artisan but times have definitely changed. There are a number of very good resources available now, and most of them are quite inexpensive so it really is worth it to invest in some advice from people who've already been there. Home Jewelry Business Expert and Jewelry Artist Rena Klingenberg has some great information about various ways to sell artisan jewelry. Her books are very thorough and easy to read and implement. They all come with some great action steps and checklists to help you keep on track too. She currently has three e-books, all in pdf download format. This is a wonderful jewelry business book for anyone who wishes to use the internet as their primary networking medium. If you are using the internet to sell jewelry and you only have money to buy one of the jewelry business books in the list, start here. Learn how to market your business using the new social media. A great starting point for those wishing to learn how to navigate the Web 2.0 world of blogging, etsy, ebay, social bookmarking, forums, squidoo lenses, and more. If you sell at craft shows, fairs, and festivals, this is definitely the jewelry business book you absolutely need to get. It is the very best and most comprehensive soup to nuts guide to selling your jewelry at shows and fairs. What if you hate selling, hate setting up displays, and hate mass producing your jewelry? This book shares a great business model that most other jewelry artists just aren't using but should really consider. A wonderful business model for the One-of-A-Kind jewelry artist that just can't bear to make the same things over and over again. As always with Rena, very thorough, easy to understand, and gives some great insight into how to be your clients' "personal" designer. Jewelry Artist Kameron Kay is the Queen of how to put your jewelry and yourself at the head of the pack - even if what you make is just like everybody else's! She's learned the keys to differentiating yourself, getting the stars to wear your jewelry, and how to shine in the spotlight rather than competing with the zillions of other jewelry makers out there. Dr. David Weiman is the go-to-guy for all jewelry sellers looking for time-tested, easy to implement jewelry business information. He is an invaluable resource for jewelry artisans. I recommend you give his products a try. I guarantee you'll get insight and ideas that will help you succeed. Dr. Dave is the longtime marketing director for Lapidary Journal Jewelry Artist and Step by Step Beads, and editor/ publisher of Jewelry Selling Insights, an email based monthly subscription newsletter for handcrafted jewelry sellers. He also does one-on-one coaching and mentoring, and hosts workshops and seminars dedicated to help jewelry sellers succeed. I have jewelry designer cyber-friends that absolutely RAVE about this newsletter. I don't sell jewelry much myself anymore, but I do know that hooking into the right mentor - no matter what your business - can really cut down on time, effort, and money spent by doing it by the seat of your pants. If you're sitting on the fence about what to spend your education dollars on, I urge you to give this newsletter a try. It's important really invest in yourself and your business if you really want to succeed rather than "dabble". "This is the ONLY jewelry-selling e-Newsletter that teaches you in-depth about marketing and selling handcrafted jewelry. You get sales-boosting information delivered to your in-box 12 times a year, and $62 in bonus materials!" Don't have a ton of time and want to increase your bottom line with as little stress as possible? This may be just the ticket for you. Dr. Weiman "seminar in a box". Get his hugely successful seminar for a fraction of the cost in the comfort of your own home. This learn-at-home program was filmed at a 3-hour jewelry selling live seminar, and then edited into a 1-hour DVD that you watch at home, as if you were there at the program! It includes a DVD, CD, Workbook, Transcript, and free bonuses. "Everyone has a different learning style, and this gives you the opportunity to learn by watching, listening and reading. Guaranteed to help you sell more!" I love workbooks. They really help me integrate what I'm learning. There are so many of us that jump into an endeavor but don't really plan it through properly - myself included! I wasted so much time! 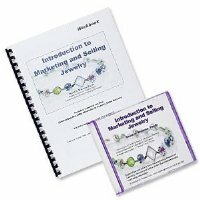 This CD and Workbook package is recommended for anyone starting a jewelry business. From Dr. Dave's website: "This 55-minute audio CD and 19-page workbook cover the basics of getting started in your jewelry selling business, whether you're a home-based jewelry seller or want more success at your retail store. Goal-setting, marketing and promotion concepts, jewelry pricing and more are covered in this program. Bonus material helps you overcome any obstacles to your success." 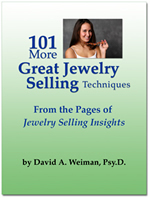 This was the very first jewelry business book I bought from Dr. David Weiman was way back in the dark ages of the internet when there was only dial-up and nobody needed spam filters yet. Although it was a while ago, this information is still incredibly valuable and useful today. I still refer to the Jewelry Selling Answer book when I need to know something:) This thorough guide covers everything from pricing to gallery negotiations, commissions and more. Is There Something You Don't Know About Yourself That Could Help You Sell More Handmade Jewelry? Are you selling with your natural personality strengths and preferences? If not, selling more of your handmade jewelry may be frustrating, and you won't know why. A Myers-Briggs personality report and one-on-one feedback with Dr. Weiman can help you learn your preferred environments and activities so that you can focus your efforts on what you're naturally good at! Learn more about the MBTI and how it can help you double or even triple your chances at business success..